So we decided to raise more meat birds. The did a group of 15 in the late winter and the spring. They turned out really well, and we have been enjoying them. It is true what they say, it tastes so much better when you raise it yourself. My husband says, “You can not buy chicken that good at any price in the store”. Even though, we calculated that our birds cost about $10 for a 5 pound roasting chicken. Not bad in my book and cheaper than the store! We recently ordered 24 slow growing cornish rock. These birds take about 10 weeks to grow to roaster size, between 4 and 5 pounds a piece. We decided to go with slow growers because watching the fast growing cornish rock birds grow was freakish. The grow so fast they can hardly move. We wanted birds that were able to forage and scratch and be more bird like. I found the slow growing meat birds at the Welp Hatchery. We have had them for about 3 and half weeks and we have already noticed a big difference between them and the fast growers. These are much more chicken like. They like to scratch and roost. They are very active, enjoy worms and fly larva from the compost pile, which is great because it saves money on feed costs. We are even feeding them hay and they enjoy that. The meat bird we raise at the end of winter did not do anything. They just laid around all day. You could tell that all of their energy went to just growing. The slow growers are also able to be kept outside, which is another reason we wanted to raise them. We were able to raise the other meat birds in our garage and it worked, but it was very dusty and to be honest with you at the end of the 8 weeks I could not stand the smell anymore. This go around we wanted to keep them in the back yard. 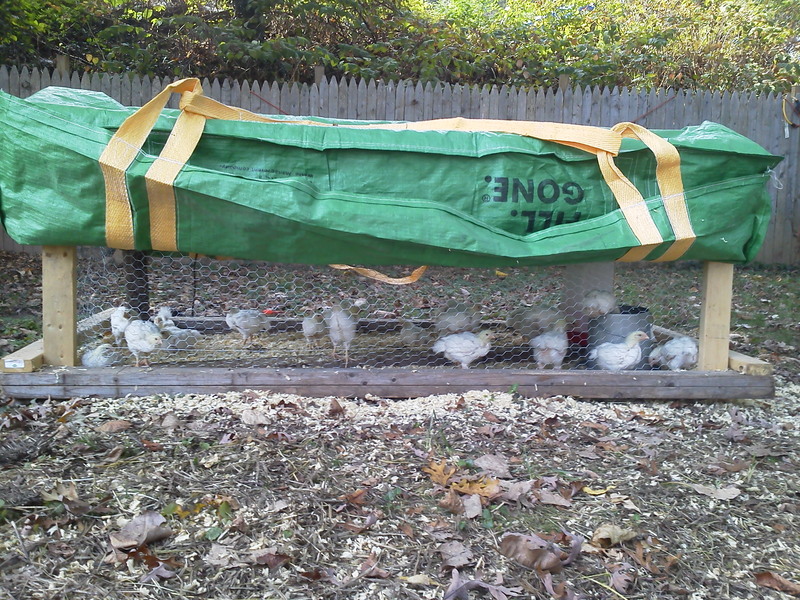 My husband built a simple chicken tractor using 2×4’s, chicken wire and a dumpster bag for a roof. The chickens were inside the house for about a week, then they moved to an empty rabbit cage in the bunny barn and finally they have been put outside for over a week. At night, we pull the dumpster bag down so it covers the sides and we turn on a heat lamp. During the day we open the sides so that they can get fresh air. We move the tractor every couple of days so that they can get new grass to eat and new dirt to dig in. We still use some bedding but not as much as we did before. Our back yard does not have the best soil quality, in fact it is all construction fill dirt, and there is almost no soil at all. After we move the chicken tractor we are planting grass seed in the bedding and covering it with straw. The only problem with this plan is when we let our laying hens out in the afternoon they are eating all our grass seed. But either way, we are still creating more soil and increasing our ability to hopefully grow grass in the future. Right now we have more weeds than grass. It is hard to believe that these birds have already been here for more than three weeks and that they go to be processed in less than 7 weeks. It is pretty cool that I have not bought chicken from the store in 9 months and we hope to never have to again! Next fall I might even be able to convince my husband to let me raise our Thanksgiving and Christmas turkey!!! That would be so cool! Our chicken tractor and the birds at 3 weeks! They grow quick!! Fall is the time of year for changing of leaves, harvesting, splitting wood, pumpkin everything, and baby chicks! Most people do not think of baby chicks when they think of fall and honestly until this year I have not either. It all started when we had a hen that decided she wanted to be a momma. She would gather all the eggs from the day and sit on them. She would get oh so very mad when we would try and take them away. My son called her “beach ball” because she would puff up so big when you opened the door to get the eggs. 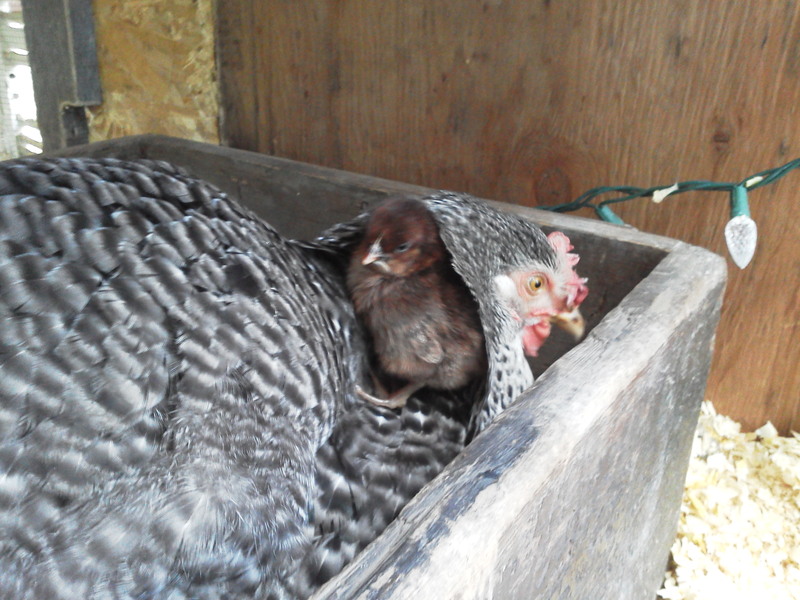 We have never had a broody hen before, so we really did not know what to expect or what to do with her. We decided at first to just ignore her, I mean really how long could this last. Well the days turned into weeks and she still was adamant about sitting on those eggs. I will get back to her in a moment. Last year we raised meat birds in the late winter, early spring. It took 8 weeks, we kept them in our garage until they were ready, took them to be processed, and we had a full freezer. It was a thing of beauty. We have been enjoying those meals through out the year, especially the ones cooked on the grill, and we needed to raise some more to get us through the winter. So we have been thinking about getting more meat birds but still had not decided one way or another and I had been dragging my feet on ordering them. Our broody hen helped us to make that decision. 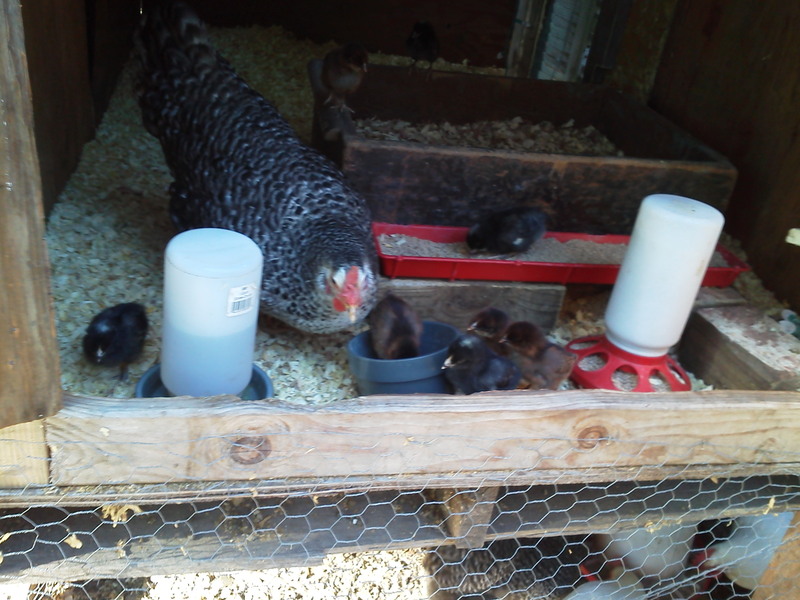 We ordered 24 more meat birds and asked them to add a couple egg layers for our broody hen to raise. We ordered our birds from Welp Hatchery, a mail order company. And for those of you that think it is cruel to order birds in the mail, please send a letter to my Councilman and tell them why I need to be allowed to have a rooster! 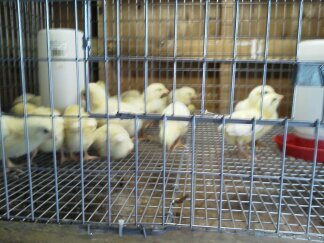 The company was wonderful and all of our chicks arrived in perfect condition. The cheeping box made the people at the post office smile. 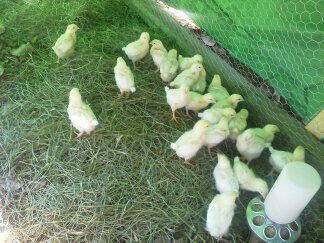 The mail order companies always add extra chicks to your order just in case some of them do not make it, so we really were not 100% sure about how many we were going to get. We ended up with 24 slow growing cornish rocks, and 8 pullets of unknown breed. 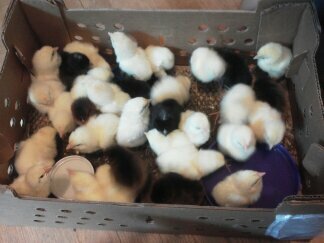 Our box of chicks, when we picked them up from the post office! Back to my broody hen. Once we ordered the chicks we moved the broody hen or our isolation coop. It is always best to move a bird at night. They go into a trance and don’t really know what is going on. We put 8 wooden eggs under her and let her sit. The next morning she was very happy to have her eggs and to be in her own space. 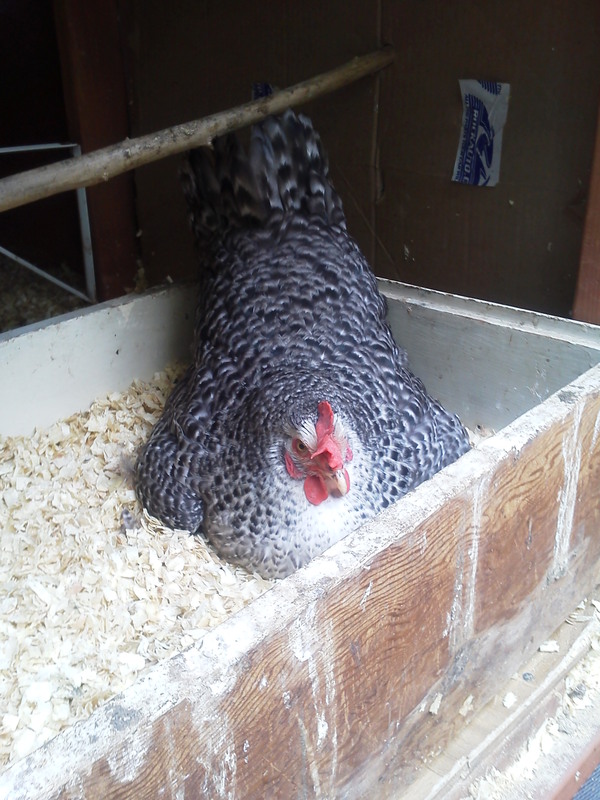 She was really happy because we put food and water close to the nesting box. She had not been really eating or drinking much the last two weeks because all she wanted to do was sit on eggs. The baby chicks arrived in the mail early in the morning. We fed, watered and watched them for the day to make sure they were all healthy, and then that night we removed all the wooden eggs and put the pullets under the broody hen. When we checked in on them the next morning they were one big happy family. It has been a pure joy watching her raise these chicks. She is very protective and will run at you when you try to change the water and fill the food. She has been a very good mama bird. She has taught her babies how to scratch and eat worms. Mama with a chick on her head! Today I was able to get a good look at the chicks. They are three weeks old and I think that we have 4 barred rocks and 4 golden laced wyandottes. A great addition to our egg laying flock! They are still in isolation, but in another couple weeks we hope to let them run with the rest of the flock. What a great experience and I am sure we will do it again.